Out of the blue, Sony has revealed the brand new PlayStation Classic - a mini console variant that works in exactly the same way as Nintendo's very own NES and SNES Classic consoles. 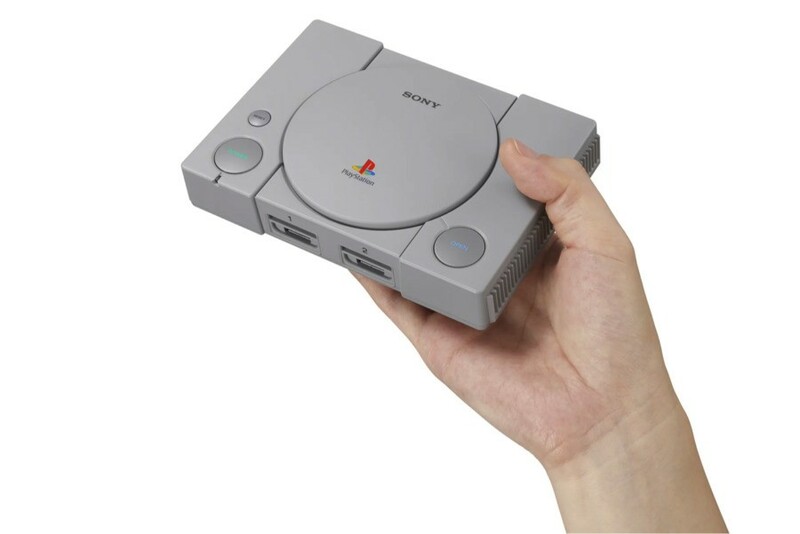 Yes, just like Nintendo's new creations, this tiny PSone-inspired machine takes the form of the original model, but at 45% the size of the system that launched back in 1995. It has 20 games pre-installed in the machine, including Final Fantasy VII, Jumping Flash, R4 Ridge Racer Type 4, Tekken 3, and Wild Arms, and will have two controllers bundled into its box. This game tally and controller count is much closer to Nintendo's SNES Mini, presumably learning (via Nintendo's experimentation) that having two controllers in the box pleases fans a great deal more than only having one. It also comes with an HDMI cable, a USB cable to power it up, and the original buttons on the system act in new, useful ways - again just like how the NES Mini's reset button would take you back to the home menu. In this case, the PlayStation's 'Open' button switches between games, while its 'Reset' has the familiar task of suspending play. Here's a video of the thing in action. It's interesting to see Sony launch a product that is clearly aiming to succeed in the exact same areas as Nintendo's recent machines, with the 'Mini' console concept starting to become a well-understood - and almost expected - thing. Of course, we've also seen that a Sega Mega Drive Mini is in the works, too. Sony's new mini console launches on 3rd December for £89.99 / €99.99 / $99.99 - so slightly more expensive than Nintendo's offerings have been. Were you expecting to wake up to this on this dreary Wednesday? Let us know your thoughts on it down below. Now we just need the N64 classic to put up with it. I honestly prefer this over the classics Nintendo throws at us. The PS1 was my first console, so it’s a definite buy for me. N64 might change my mind about Nintendo’s efforts. Might buy it. I've never been a PlayStation guy, have one that someone gave me and I own just 9-10 games. But it's 20 bucks more expensive than the SNES Mini, with one game less. Just saying. It will heavily depend on the line-up and the quality of emulation. It will be interesting how they manage those polygons to look as good as pixels do in the current minis on a flat screen. I won't buy it because i use my Japanese PS2 Slim to play BOTH Japanese PS2 & PS1 games. Sony doesn't respond to nintendos succes sega and atari nade these things since the year 2000. @StephanDLW this expkains why ff8 wasn't in last weeks ff direct announcement it will probably be on the ps classic exclusively for a year or so. @The_ghostmen Of course it's Sony responding to Nintendo's success. Atari and Sega made these things since the early 2000s, and nobody followed suit because they simply weren't successful enough to be worth copying. The NES and SNES classics were, hence the Playstation classic in short order. I don't really see why that's a problem, though - half the industry is built on repeating or copying success. IMO most of the PS1 era games have not aged well. Interested in the classic PS1 Squaresoft lineup, but I expect my most wanted games will be absent (Xenogears and Chrono Cross), and I already own basically every other PS1-era title I would want on another platform. Wild Arms in it... Insta buy for me ! Of all the ideas they could steborrow from Nintendo, this is the best one. Not a fan of the ego the PS Classic's trailer - devoid of all subtlety - uses a song containing the lyrics "oh wow, I can't believe my eyes" with, but then again, the Switch was first revealed with "ah ha, ah ha, yeah" so I can't complain in that regard. What I'm really not a fan of, though, is the complete lack of knowledge of the remaining 15 games. Other than that, it's a perfect companion piece for my SNES Mini. Haha, more of Sony's "innovation." Oh Playstation, copying Nintendo since 1995. I don't understand, why only 20 games?? Typicall of Clony. In 90s lingo... Sony does what Nintendo DOES. Unfortunately many PS 1 games have not aged very well due to being early 3d games( the same would be true for n64) . But I still like these mini consoles. Brilliant,just preordered,will sit nicely next to my mini NES and SNES in perfect harmony. I'd be all over this if it could play the PS1 Classics I own on PSN (and sometimes also on original disc) but can't play on the PS4. Although all of these mini consoles would be improved with wireless controllers. Sometimes I buy a game 3 or 4 times before I actually play it. Sigh. @Bunkerneath said :"why 20 games ?" Not interested. PS1 games aged badly. And more importantly I have no nostalgia for Sony’s first console. The only “mini” that I was interested in was SNES Mini. Although if this one becomes hackable maybe I give it a shot. I'll wait for news that you can inject additional ROMs before committing. Going by the rrp I'm guessing Sony won't limit the numbers produced as badly as Nintendo did, so hopefully picking one up after launch won't be too much bother. 3D games haven't aged well. I would love a Sega Saturn mini with some of its gorgeous 2D games! Lol i never liked the first playstation, i actually hated it. the only thing that i liked where the cutscenes. I hope sega gets on board with their 2D consoles. Mini Saturn or Dreamcast would me must only if it is not handled by Atlus. Not sure about PS mini, have they revealed a full list of games? Sony doing something after Nintendo makes it popular?! When has THAT ever happened? ''C'mon Sony, give us a PS1 Classic'', ''We want a PS1 Classic too'', ''Y no PS Classic? '', etc. ''Ugh... Sony copying Nintendo again'', ''Yeah, Nintendo did this before'', ''Riding off Nintendo's success...'', etc. I am buying that first available opportunity. Nintendo the HHH of gaming it seems then. Joystick, motion controls, now a whole console! Well, since I really want an N64 Classic (with Goldeneye - I know it's unlikely) and for SEGA to join the party, this can only be a positive really. If it sells well, it proves the market is there for the early-3D era of retro gaming. Is it really Sony copying Nintendo though? Micro consoles existed 'before' the NES Mini. Plus, doesn't it makes complete business sense to follow what others have done when it's profitable to do so? We yell until we are blue in the face on here that Nintendo need to copy Sony and Microsoft when it comes to proven, industry standard online infrastructure and functionality, but Sony looking at what Nintendo are doing and following suit, that's deserving of criticism? Get real. If Wipeout, Wipeout 2097 (XL) and Wip3out incl. Special edition are on there I'll get it. I still play those games, even now. Sadly through emulated means as my disks are scratched to heck. Nintendo saw success in retro consoles, other major companies are doing it. That's pretty standard in any industry. i would have gotten it. if it had the option to run physical games too. but i'll stick to just playing ps1 games other ways instead. I like the ps1 back in the days but I can still play my games on my ps3. And the ps1 games didn't age really well, 2d game age much better. And 100€ is too much just for the nostalgia. Will await the full list of games. The five are decent headliners (well most of them). I would prefer them just being available over PS+ though. Bought Dark Cloud from PS2 era and that was great as I remembered. Would be keen to see more from PS1. Just like with the Nintendo Classics, it’s a cool idea but I don’t have the nostalgia for it. Id be down for a PS2 or PSP Classic though. This is pretty cool. PSone games haven't aged well, but I might get one just cause it's pretty neat. Sit next to the SNES. I'd be in it for the RPGs. It doesnt matter if someone made them in 2000 and sold a few thousand units, because they didnt decide to make one until Nintendo did, and was successful. Nintendo made the mini console popular, thats just a fact. Sony isnt copying the failure of a 2000 Sega console, they're copying the success of Nintendo with NES and SNES mini, just like Atari. what are the other games? "It also comes with an HDMI cable, a USB cable to power it up, and the original buttons on the system act in new, useful ways"
Good for those wanting to relive PS1 nostalgia, but aside from FF VII (which is being re-released and remade for everything) I'm not sure those games aged as well as 16-bit ones. No doubt it will sell, but I have little knowledge of PS1 games. Anyway, looks great, too bad it doesn't have the DualShock controllers. I'm interested in the full lineup, but I won't be buying one, it's just too expensive for me. It definitely interests me more than the NES and SNES classic, just because I already have almost all th games included on them in some form, but I don't have that many PS1 games. And PS1 is by far the best PlayStation, fight me. Once again Nintendo does something that's already been done and then anyone who comes after that is copying them apparently. @Heavyarms55 Actually scrap that. I misread your comment. If it has Castlevania: Symphony of the Night on there, I swear to god I'm buying one for every TV in the house. A Sega Saturn mini would be the absolute balls. Panzer Dragoon 1, 2 and saga ready to play. A little virtua fighter. Bliss. PS had so many solid games in terms of the gameplay that the shortcomings on the visuals, by today's standards I mean, almost fades away into irrelevance. Almost. Once you're playing, and engrossed in the game I mean. I used to think that most PS1 games were ugly back in the 90's so I'm sure they'll look even worse now. Perhaps that was just the teenage fan boy bias in me though. I've never owned any PS consoles so something like this is appealing but I think I'll hang off for the inevitable PS2 Classic. If there's Castlevania Symphony of the Night in it, I'll buy. Nice! A time, where Playstation consoles where still interesting with plenty of really different games to choose from. @Atariboy So apparently it's just like the NES and SNES Classic, no AC adapter, but it does come with a USB cable. So you can plug it in the back of your TV for example. If you want to plug it directly into a power socket, you need an adapter. I was confused about that too. They're copying the success of Nintendo with their mini consoles. That's... just what it is. Nobody said Nintendo invented the mini console, but you can be dang sure it's Nintendo's success finally doing it right they're emulating. Question is why people get so defensive about that. Just call it for what it is and let's move on. No need to take a hit to the ego over it. It's a cool console. I'm glad so many companies are following Nintendo n this. A lot of fans will be happy. Hope they announce Metal Gear Solid or Resident Evil for it as well in the upcoming days. As for my predictions on the other games, I think Parappa the Rapper, Medievil and Wipeout are probably the safe bets since they're developed by Sony. @Haywired don't be stupid 😂. Only reason Sony is even thinking of doing this is because Nintendo made it work so well with the NES Mini and SNES Mini... There's no chance in hell Sony would have ever done this had Nintendo not done it first. Sweet, need to scoot over to PushSquare and gush about the PS1 there. I might get mauled if I do it here. That said, this is one mini console I would actually consider getting, since right now, my CRT is on the fritz and I haven't fully made the transition to HD yet with some of my consoles. Getting my PS1 up to snuff on my HDTV would probably require some extra parts. Buying a mini pre-loaded with PS1 classics would be nice. Just think in 20 years there will be mini consoles with huge modern games such as Breath of the Wild, GTAV, Read Dead Redemption 2 etc...a wee nostalgic trip down memory lane. There will be folk online, some not even born yet complaining about the line ups and how Uncharted 4 has aged terribly. An Xbox Mini 45% smaller than the original would still be a pretty big console haha. That thing was a monster. Forget all this copying business. This is great for gamers. @Haywired Lol. You ok there? SEGA, Atari, Commodore, etc had put out inferior unpolished products with 0 traction. Nintendo classic mini took off and that's why Clony is copying as they don't want to leave money on the table. Sure there were smartphones, tablets and PDA before the iPhone and iPad, but when Apple managed to come up with a polished product.. that's when the market took off. Similar thing here. Well Atari and Commodore have been doing these little consoles for ages - the only thing Nintendo can take credit for is that they made it popular - and they made it popular because Nintendo IS popular. And people genuinely want Sony to do something like this - just because Nintendo took an idea that existed and popularized through marketing, doesn't mean that idea has to be exclusive of Nintendo. It's like saying that all mp3 players are a rip off of the iPod, even though the iPod wasn't the first mp3 player - it just happened to be the most popular among the mainstream crowd. I'm sure the main difference between this PSX mini and NES mini is that I will actually be able to walk into a shop and buy one. I hope loading times will be boosted, because the one thing I remember doing most in front of a Playstation is waiting ! I’ll probably pick this up, but it all depends on quality, authenticity and which games are added. For instance, this better be the PSone version of FFVII, not the «enhanced» PC port. I’m a little worried what this means for PSone games on PS4, though. @OorWullie By that point most likely you'll just have a wireless controller that connects to the Internet and a subscription fee to pay. All of the games hardware will be on a server farm somewhere. Good news is that this may open up the possibility to play games from all studios and systems in one place, like a kind of playable Netflix, but I'm sure there will be examples like HBO with their own separate service you need to subscribe to. In the next E3 id love if Nintendo brings their own poodle, calls it Sony and makes the poddle follow it around on stage. @Spectra Have you bought any of the announced games on the PS4? OK, so we have: SEGA, Atari, Commodore, etc. retro consoles. Nintendo makes a retro console: Not copying because Nintendo is the master innovator who invents everything. Sony makes a retro console: Copying Nintendo!! I'm not a Sony fan (never owned a Sony console), but people are obsessed with accusing everyone of copying Nintendo all the time. @Haywired dude those where some washed up attempts at retro games, if those where the only attempts you think a company like Clony would copy that? Sony didn't look at those washed up attempts at retro gaming to make theirs... They looked at Nintendo... A child could see that. Edit: Like Sega's ATgames consoles??? 😂😂😂 oh god don't make me laugh!!!! You think Sony saw those failures and said "Yeah lets do this"? @Spectra Wild Arms is not on PS4 (Wild Arms 3 is), and it’s the PC port of FFVII. Sony has yet to release PSone games on PS4. So much for «decency». Hmm that’s a bit too expensive for an impulse buy. I may bite if the list is good. OK, so Sony copied Nintendo's retro console idea, but Nintendo didn't copy the original retro console idea. Only Sony can copy. @Captain_Gonru Hey, this way they can sell you analogue controllers as accessories. I want this! FYI. Nintendo didn't make retro consoles first. SEGA made megadrive retro before the N.
@Haywired yep Nintendo did copy it... And made it 10 times better... Just like they did in 1983 after the crash. Those poor attempts at retro gaming, especially by Sega, was not the ideal example of how to do retro gaming. So lets break this down. Nintendo saw others attempting to make games and failing (just like in 1983) - came over and did it right. Everyone else follows suit. Especially Sony, who's had their nose up Nintendo's back side since the 90s... Just sniffing out what to do next. Like i already said... Do you actually believe Sony would have ever botbered to do this if the only example on the market was the ones you gave? Thats just delusional. @readyletsgo It's got USB, soooo... yeah. The only way this thing will be purchasable. It would be closer with MGS and Castlevania Symphony of the Night, but still. However, unlike the NES Classic Edition, this will certainly not be able to fit the entire library of games on it, which is unfortunate. Never owned a PS1 so nonreal nostalgia and whilst have acquired a PS1 collection, most are lesser well known, niche titles. I personally felt the PS1 was a console of some of the best 2D sprites whilst I found the 3D polygons haven’t aged well. Will wait for full list (Wild Arms’ inclusion suggests it won’t all be the multi-million selling big nake franchises) but lets see. @wolvesboy just saying, but Sega and Atari had classic consoles before Nintendo released one. But I do think Sony reacts to Nintendo more then any other company. @ClassSonicSatAm said "So why just install a bigger hard drive on this? it's 2018"
It would be nice to experience PS1 games without the horrible CD load times, especially in turn-based RPGs where you would hear the disc mechanism every time a random encounter starts. That said, I owned a PS1 and played it a lot. Even in those days, the graphics seemed kind of awful, so I’m not sure that I would be able to enjoy these games again in the same way as classic pixel art games. Who else remembers being blown away at how much better PS2 looked when it launched? Metal Gear Solid 2 seemed like a miracle of technology at the time. We don’t get such big generational leaps anymore between consoles or PC games. Good for them. If only they had their own games to put on the thing instead of everything being 3rd party. Awesome! Now, all we need is a GameCube, Dreamcast, and N64 Classic and my retro gaming life will be complete! Hmm...I guess I still don't get the appeal. I'd rather have these games on the same hardware as all my current games. Same goes for NES and SNES which I prefer on my 3DS. Makes me wonder why PS1 games aren't as available on PS4 as they were on PS3. Unless you can legally add more games to this one, it kinda makes it a little pointless for me. I'd rather just download PS1 games on my PS3. Wonder if it'll include Symphony of the Night though? @SimplyCinnamon53 Good luck as soon as you by FFVII you would’ve been better off buying this. Besides, PS CDs are fragile. It’s a cool novelty atleast. Well there goes my wallet. @8bit4Life Play on a CRT dude ! Duh it's ugly on a flat screen, They're not made for 240p sources. PS1 one is my second gaming machine after the Gameboy. But this obviously points out that Sony is watching what Nintendo is doing for sure. Nintendo isnt the first one but they are the ones gaining mainstream succes with it classic minis. There were many demands for something like this from Playstation fans way before the NES classic even existed, Why didnt they do it sooner. Well it was only time until Sony did this... it's Nintendo's fault the Playstation existed in the first place, so it only makes sense. Honestly, I'm not sure for what reason news of this announcement is on Nintendolife. Other than to stir up trouble in the comments section. Sweet, I'm interested. Need to see what the other games are and if the emulation is good. PS1 had an absolutely insane library, there should be more than enough good ones to make this worthwhile. @The_ghostmen both of those systems never reached the popularity of the Nes and SNES classic, and had many emulation problems. Nintendo could arguably be the first company to do a mini System right. ps games (and n64) aged horribly. the early 3d stuff was just bad all around and i just don't have any nostalgia for that stuff. give me ridge racer arcade, daytona arcade, etc. and sure. it'll be fine. the ps/saturn just no. no. no. I’m surprised that a company at the front of technology like Sony haven’t put an internet connection in it and a way to add more games. People slammed Nintendo for being so shortsighted. This is clearly aimed at grabbing money based on nostalgia the same as Nintendo’s. More expensive too, and they haven’t learned from Nintendo’s mistakes by making you press a button on the console to switch games instead of on the controller. The least they could’ve done is announce the full list of games too because right now the only appealing game for me is Final Fantasy. It’s a pretty lazy announcement and I expected better from Sony. It's really cool but I'll probably skip. I don't play my NES or SNES Classics as much as I would like to. Plus, the 8-bit & 16-bit games have aged better then the 32-bit/64 bit generation of games. Some of those early 3D games that everyone has fond memories about are hard to play these days IMO. I love PS, but I didn't have a PS1, so I don't really have any strong feelings attached to it whatsoever. I played Crash Bandicoot and Spyro on my cousin's PS1 a fair bit when I was little, but that's as far as my memories go. I'd sooner buy an N64 Classic. $130CAD for 20 games seems a little too dear for a system I have no connection to. You could buy a used PS1 system and the games you want to play for less. I don't play my Nintendo Classics as much as I'd like to. I just put my SNES Classic away a couple weeks ago. So I take that as a sign of what to do. Besides, everyone knows the PS1/N64 era games have aged like milk in more ways than one. Overpriced. You only get 20 games and the controllers don't have analogue control. These systems on a chip are getting less value with every release. @nonprophetmusic sure we only need to add a few games at a time 😊. Looking forward to this. And if it can play Dreamcast, that would be incredible, Saturn too maybe. Edit: so if there is a usb that means we can use 8bitdo usb connector and link a PS3/4 controller? Thumb sticks are a-go! @BladedKnight No. Nintendo must release the N64 mini. Especially after this. Never owned any Sony console. I'll probably get this for Xenogears assuming its hackable. So it doesn't have dual shocks? Wow. Could you even play the 3d games with the OG controller? A cute novelty, but the games look like absolute garbage. I would rather buy a contemporary in any of those genres for the Switch instead. What the heck is a mega drive? Noticed the Amazon listing carries a PEGI-18 rating on the front of box... but no 18 rated games have been confirmed on the console yet by Sony. Syphon Filter 2 all but confirmed? I don't know what all the complaints are about Sony copying Nintendo. We get more of a good idea. I'm kind of irked that they aren't showing the full games list for this though, because that's going to be the deciding factor on whether I get this or not. If it has Final Fantasy VII, VIII and IX plus Xenogears, that alone is worth the price for me. @nocdaes Metal Gear Solid seems like an obvious choice. Find it hilarious that people act like Nintendo was the first to do this when other console makers had been making the equivalent of this long before the Nes mini. Of course that doesn't fit the narrative so it is ignored. As a retro collector I already own 4 of the 5 games listed so will have to see if the rest of the line up warrants the price tag. it is damn cute though! Have they really only announced 5 of 20 games, and are people really deciding whether it's worth the price or not on those 5 games? I'm not impressed by those 5 either, but judging by the small collection of PS1 cases on my shelf, and the ones I've been regretting for 20 years I traded in to Gamestop, there are some really good games that could be on there that don't get ported a lot. FF1-9 that everybody was so happy Switch is getting, trust me, those FF games on Switch won't be only $10 each. Some of those are ports to PS1, but that's what's on my shelf. Honestly I'd probably pay $100 just for 20 Squaresoft games but this could potentially be good. Or it could be 10 very bad sports games. I can't decide if I want 1 or not until I know what I'm paying for. Fingers crossed for LSD Dream Simulator. Never having owned a PS1, I might pick this up to see what I missed all those years ago. You know something, this has really made me want a Saturn Classic, with Sega Rally Championship, Panzer Dragoon (probably all of those games), Virtua Cop 2, Virtual Fighter 2, Guardian Heroes, Saturn Bomberman, Nights into Dreams, etc. @OorWullie that's funny. it would also be funny if Microsoft does a mini Xbox and they make it smaller than all the other mini consoles. It's Bleamcast in a box! I still have my discs for the Dreamcast. I bet they announce Metal Gear Solid and Gran Turismo 2. Tekken 3 is already there. I might get this thing if it has The Legend of Dragoon on it. If not then I'm fine not getting in on this cash grab. Where would Sony be without Nintendo. @readyletsgo I'm sure the USB port only functions for power. Ok, color me... not entirely sure, but very presumptuous. Err... very presumable, in my opinion. We'll see how it goes though. Heck, it might be the perfect slew of games. Idk. But the analogs? They weren't originally released with the first playstation, for the first couple of years, so if we can't figure out plain ol' USB controllers, you can bet pretty penny we'll be spending a pretty penny on "Classic CompatibleTM DualShock Controllers." @GrailUK maybe not here, since Nintendo wanted them to pursue games on disc with a Super Nintendo add on, but they are an entertainment GIANT, so it would've likely happened at some point. I mean, they're in everything. Music, movies... other forms of digital media... Whatever. But them getting in when they did? One of those 20 un-announced titles has got to be "Jumping Flash 2: Big Trouble in Little Muu" or what's even the point? Parappa the Rappa, Wipeout, Twisted Metal and Metal Gear Solid have to be in. I don't understand why they don't release the full game list, given it comes out in mere months. It's kind of worrying, as if they don't have everything locked down, but maybe it's just a marketing thing. I'm tempted to get one just for FF7, but if this thing has RE2, it's a day one purchase for me, as I've been dying to replay that game, and I seriously dislike the direction the remake is taking. @saintayu It's not that Nintendo did it first, it's that they had immense success with it twice in a row, proving there's a market before investing into more involved projects like this. This is no Atari Flashback, just the licensing is probably a lot of work to get this out. While I love the 16bit era graphics, I really can't stand the sight of PS1 3D. I prefer remembering with nostalgia some of those moments, seeing these games and how badly they've aged will prevent me from buying one of these. You mean like how SEGA and Atari released mini consoles YEARS before the NES mini released in 2016? Really cute though. These devices may be meant for people who don't buy modern consoles, but lets face it, the real point is collectors. It's a neat display item. Is this going to sell well? It's weird, but I have a bad feeling about it. It's nostalgia for me is slightly off point. I mean, I'll be picking one up most likely...but it's not quite getting my hyped. @Cobalt Well that's different, with the Switch you use game cards and expand that 32gb hard drive with micro sds easily. With this, your just stuck with 20 games. even my GPD XD has way more PS1 games then that. (as well as Dreamcast games) and it's only has a 32gb. Looks like there's only 8gb at the max on this PS Mini. No Dualshock is a very bizarre choice since that means some of the later games on the system like Ape Escape can't possibly be on it. I expect Sony to re-release the PS Classic with the Dualshock controller...only after the N64 Classic is released. Don’t need this. I still have a the actual original ps1 mini that plays cds, and a fold up lcd screen attached. I know I can’t attach through hdmi, but I really wouldn’t want too. 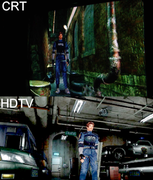 The games still look ok on the old little screen, but on an hd tv or monitor, not so good. Besides, I plan on getting at least a couple of my favorite final fantasty games on switch, so...not really needing this for $100. Rather get some more games on my switch. How can you compare an "high end" new portable/hybrid with a retro/mini console ? Intelligent Qube. That is all. @Haywired I think the case is that Nintendo is the first company to make their retro console into a must-have item that could use the retro catalog sell millions. Shortly Nintendo proves that the business model is a repeatable success. Sony comes out with a system with the same approach down the naming convention. It's pretty transparent which retro console has spurred Sony to make their own. @nab1 lol, goal posts changed. Several people are claiming Nintendo did it first. Also Nintendo engineered a shortage to drive sales, will Sony copy that? I like it, but, I feel like I can get these games on my PS4 or PS3, but, I guess if it loads up fast, and if they shortened load times, it's probably pretty cool, as long as the games are good. And, I guess it will be nice to have a couple Playstation USB controllers for whatever. I saw it coming. No Dualshocks? Lol. No Metal Gear Solid or Symphony of the Night? Resident Evil Director’s Cut? Ape Escape? WipEout? Does Sony even know the 20 games on this thing? Lol. Ah well. Oh oh oh!!! Sell “Memory Cards” that have extra games on them, normally not included with the system! Lol. I wonder if Nintendo announces N64 mini? Sony the copycat hacks, forever and ever. Depends on the games, but likely more than 8 gb. Of known games, ff7 is 1.36 gb, wild arms 300 mb, ridge racer 4 is 331 mb. Those are totals off ps3 psn. So those 3 games come to about 2 gb. It looks like there could be many rpgs and many of them were multi disc. Or they could come with smaller games. @NEStalgia Xbox mini, so humongous, yet so cute. Oh wow, I always wanted a PlayStation and now I'm getting one! Hope they can get the essentials: crash team racing, metal gear, ape escape, crash 3, tekken3,chrono cross and a Spyro game! The problem is the majority of PS1 games just haven't aged that we'll that were originally ground breaking and or incredibly fun way back when. Proper for throwing in jumping flash! however. But they should of ditched the RR sequel and stuck in the first ridge racer. Well the original retro consoles must have been successful enough to still be on the market to this day and successful enough for Nintendo to think that it could be a fruitful market for them to get into. Of course, I don't care if Nintendo "copied" them or not, I just think it's a bit rich for everyone to go nuts over this. @Haywired Original retro consoles successful? No. Did the market have potential? Yes. Nintendo packaged everything right: IPs, nostalgia peeks, fanbase, attention to details, etc in a way that no-one had done in the past. And it this that Sony is copying: there's copy Nintendo's vision and Nintendo's execution. Heck even the hand holding the Mini picture is copied! I do find it kind of funny though that most of the console seller titles on this thing are games that are just now releasing (in better versions) everywhere: Old FF, Crash. Different markets, I know, most people buying this either already have a current console or are never going to buy one. But it's funny. @sdelfin The full size controller replica will be bigger than the console. @Haywired It's more about the general approach. I think a good analogy would be The Wheel. Atari and Sega made a Triangle Wheel. Then Nintendo made a Circle Wheel. Then Sony made a Circle Wheel. Sony didn't copy the concept from Nintendo, but they are copying Nintendo's version of the product. So what's so different about Nintendo's mini consoles to the previous mini consoles then? They're all basically the same concept/product. Please come with Einhander, Final Fantasy Tactics and one of the Bushido Blade series. Which I just realized where all Squaresoft games lol. @Cobalt Ya do realize Switch games are alot bigger then PS1 games right? PS1's Crash 1 to 3 is "just" about 1gb... the Switch's remasters is 5.2GB See the problem?